Cover: William Blake, Dante engravings plate 6, “The Pit of Disease: The Falsifiers.” Courtesy of the British Museum, Department of Prints and Drawings. STUART ATKINS is Professor of German Emeritus at the University of California at Santa Barbara. 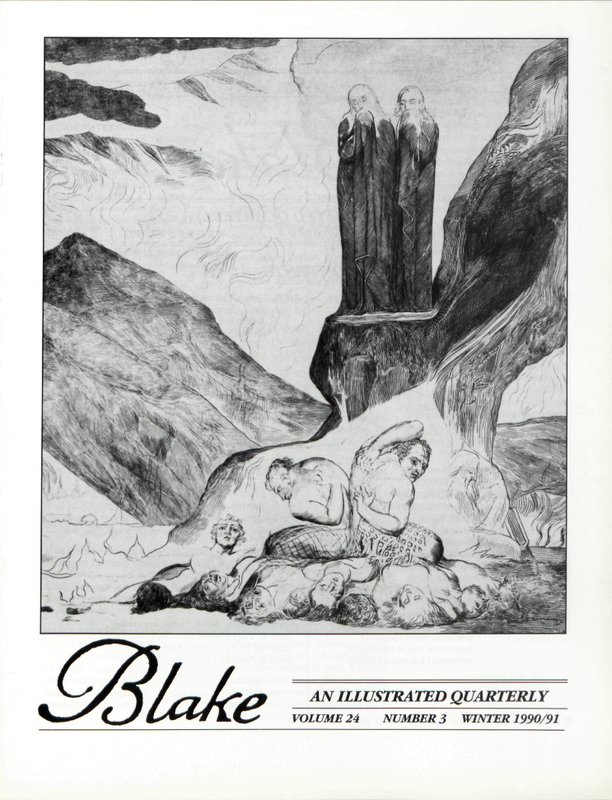 LISA PLUMMER CRAFTON, an Instructor of English at West Georgia College, is finishing a dissertation on Blake’s Songs and Wordsworth’s Lyrical Ballads for the University of Tennessee. ROBERT N. ESSICK is Professor of English at the University of California, Riverside. BRUCE E. GRAVER, Associate Professor of English at Providence College, is editing Wordsworth’s Aeneid translation and Chaucer modernizations for the Cornell Wordsworth. DAVID GROVES, a Canadian university lecturer, is the author of six books on the poet and novelist James Hogg (1770-1835). MICHAEL FISCHER is Professor of English at the University of New Mexico and the author of Stanley Cavell and Literary Skepticism (U of Chicago Press, 1989). EDWARD LARRISSY is author of William Blake (1985), and Reading Twentieth-Century Poetry: The Language of Gender and Object (Blackwell, 1990). JOHN MEE, Lecturer in English at the Australian National University, is the author of Dangerous Enthusiasm: William Blake and the Culture of Radicalism in the 1790s (forthcoming, Oxford University Press, 1992). BRIAN WILKIE, Professor of English at the University of Arkansas, Fayetteville, is the author of Blake’s Thel and Oothoon (English Literary Studies, 1990) and (with Mary Lynn Johnson) Blake’s “Four Zoas”: The Design of a Dream (Harvard UP, 1978).